Poor Attic Ventilation Can Ruin Your Insulation, Destroy Your Shingles, And Even Raise Your Energy Bills Improper! An estimated 9 out of 10 homes in North America do not have proper attic ventilation. Why? Because most people are unaware that attic ventilation can impact the longevity of their entire home! In cold northern climates ice dams can form on roofs, which may force water back up under shingles and into the home. Why take Such Time Consuming Expensive risks? With advances in construction products and procedures, heat, moisture and condensation that used to escape through walls and windows are now building up inside of homes and attic spaces. 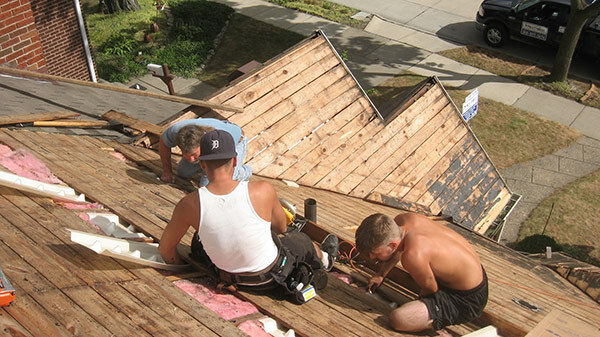 An excess of attic heat can lead to moisture build-up in the attic, increased energy costs, ice dams and potential damage to roofing products and structural supports. 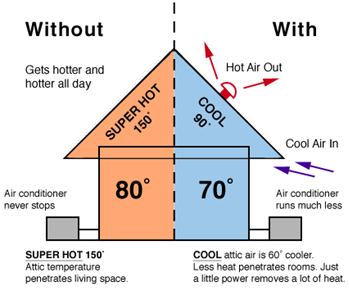 Reduce excess heat and moisture in attics with proper ventilation. Reduce excess heat and moisture in attics with proper ventilation. The best way to ventilate an attic and ensure a balanced and functional system is to use continous soffit (intake) and ridge (exhaust) vents. Calculations for a properly balanced system can be achieved by following the FHA (Fair Housing Administration/HUD) 1/300 Rule. This calls for 1 square foot of net free ventilation per 300 sq.ft. of attic floor area. How do soffit and ridge vents work? 90% of homes in North America are inadequately ventilated. Attics need effective ventilation to keep homes cool. All manufacturers require attic ventilation. Intake and ridge vents working together are best. It’s important to understand that a properly ventilated roof relies on a system of products such as Cobra Ridge Exhaust Vents that work in conjunction with soffit vents or fascia vents AND PROPER INSULATION. 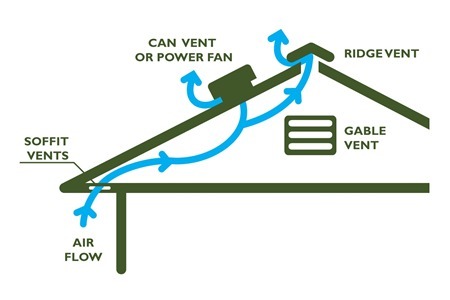 (CLICK HERE FOR MORE INFO ON BLOWN-IN INSULATION) The GAF Roofing Systems video below outlines the reasons, benefits and process of proper attic ventilation. It’s geared a bit toward us contractors, but the information really helps explain why this is so important to your house, your comfort in the COLD winter, the HEAT of the Summer and keeping your energy bills low. 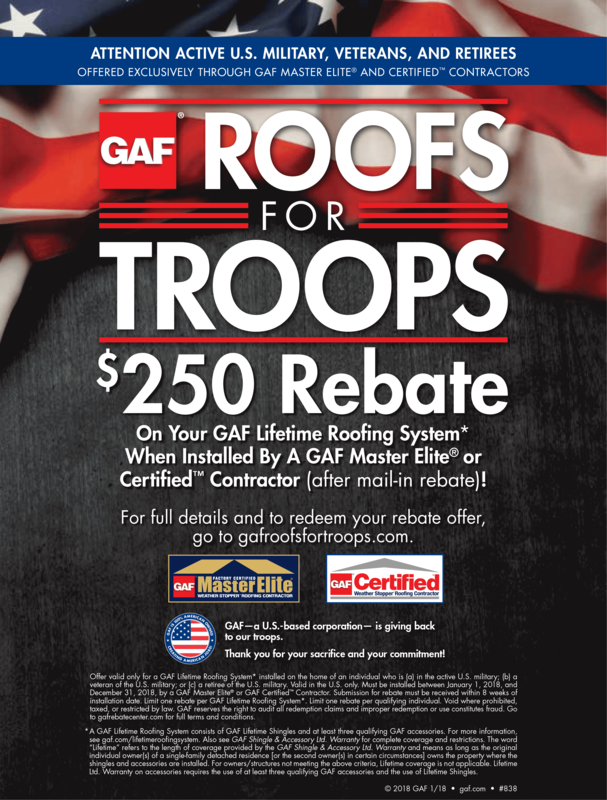 Winter Temperatures and Snow Combined with Poor Roof Ventilation Will Damage Your Roof and Lead to Expensive Repairs. To learn more about Proper Attic Ventilation or to schedule a FREE Inspection of Your Roof, please fill out the form below and we will contact you to schedule an appointment to come out and take a look at the health of your Roof and inspect your Attic for Proper Ventilation.